ALLERGIC CONTACT DERMATITIS FROM FORMALDEHYDE EXPOSURE. Formaldehyde is a ubiquitous chemical agent, a part of our outdoor and indoor working and residential environment. Healthcare workers in difficult occupations are among the most affected by formaldehyde exposure. Formaldehyde is an ingredient of some dental materials. Formaldehyde is well-known mucous membrane irritant and a primary skin sensitizing agent associated with both contact dermatitis (Type IV allergy), and immediate, anaphylactic reactions (Type I allergy). Inhalation exposure to formaldehyde was identified as a potential cause of asthma. Quite a few investigations are available concerning health issues for dental students following formaldehyde exposure. Such studies would be beneficial for early diagnosis of hypersensitivity, adequate prophylactic, risk assessment and management of their work. Key words: formaldehyde, allergic contact dermatitis, occupational exposure, dental materials, healthcare workers. Please cite this article as: Lyapina M, Kisselova-Yaneva A, Krasteva A, Tzekova–Yaneva M, Dencheva-Garova M. ALLERGIC CONTACT DERMATITIS FROM FORMALDEHYDE EXPOSURE. J of IMAB. 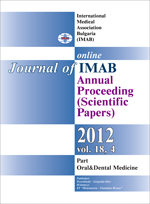 2012; 18(4):255-262. doi: 10.5272/ jimab.2012184.255. 21. Crump DR. 1995. Volatile organic compounds in indoor air. In: Hester RE, Harrison RM, ed. Volatile organic compounds in the atmosphere. Issues in environmental science and technology 4th ed. Cambridge: Royal Society of Chemistry, 109-124. 35. Garcia JP, Beyne-Masclet S, Mouvier G. Emissions of volatile organic compounds by coal-fired power stations. Atmos Environ. 1992; 26A(9):1589-1597. 43. HSDB. 2009. Hazardous Substances Data Bank. National Library of Medicine. http://toxnet.nlm.nih.gov/cgi-bin/sis/htmlgen?HSDB and search on CAS number. Last accessed: 6/2/09. 60. Maibach H. Formaldehyde: effects on animal and human skin. In: Gibson J.E., ed. Formaldehyde toxicity. Washington, DC: Hemisphere Publishing Corporation. 1983 166-174. 63. NTP (2010) Report on Carcinogens Background Document for Formaldehyde. National Toxicology Program. http://ntp.niehs.nih.gov/ntp/roc/twelfth/2009/November/Formaldehyde_BD_Final.pdf . 64. Ohmichi K, Komiyama M, Matsuno Y, Sawabe Y, Miyaso H, Fukata H, et al. Relationship between exposure to formaldehyde and immunoglobulin E (IgE) production during the gross anatomy laboratory. J Health Sci. 2006; 52(5):642–647. 85. Zina AM, Fanan E, Bundino S. Allergic contact dermatitis from formaldehyde and quaternium-15 in photocopier toner. Contact Dermatitis. 2000 Oct;43(4):241-2. [PubMed].